They celebrated like they had won when Pierre Gasly concluded the Bahrain Grand Prix in fourth position, having driven a faultless race. By doing so, the French rookie also secured the best finish for a Honda powered car since the Japanese manufacturer returned to the sport in 2015. "Unbelievable, what an incredible day! ", commented Pierre Gasly. "The second race of the season with Toro Rosso and Honda, and we finish P4. It’s just amazing, I’m so happy! A big thanks to the team because the car was fantastic! I had a nice fight with Magnussen and the pace was really good. I saw unfortunately both Red Bull cars had to stop, then after Raikkonen retired the team told me we had the opportunity to finish P4, so I gave everything to the end. "The car has been fantastic since the beginning of the weekend, today I could just push flat out and the pace was great because I managed to pull away from the Haas. I need a bit of time to let this sink in, but we will definitely enjoy it with the team tonight! The start of the race was mega - I managed to overtake Ricciardo in Turn 1 which was great, after that it got a bit tricky when Magnussen overtook me in Turn 1, I knew I had to overtake him straight back because I would lose time and it would be difficult to catch him afterwards. Once I passed, I managed to keep him behind and push flat out while I was trying to manage the tyres, which we did pretty well. Indeed, Gasly didn't put a foot wrong, and a strong start was the foundation for this result. Team principal Franz Tost also pointed out that the car's new aero package had a lot to do with Toro Rosso's sudden surge. “Fourth place is a fantastic result for Honda and for Toro Rosso", he said. 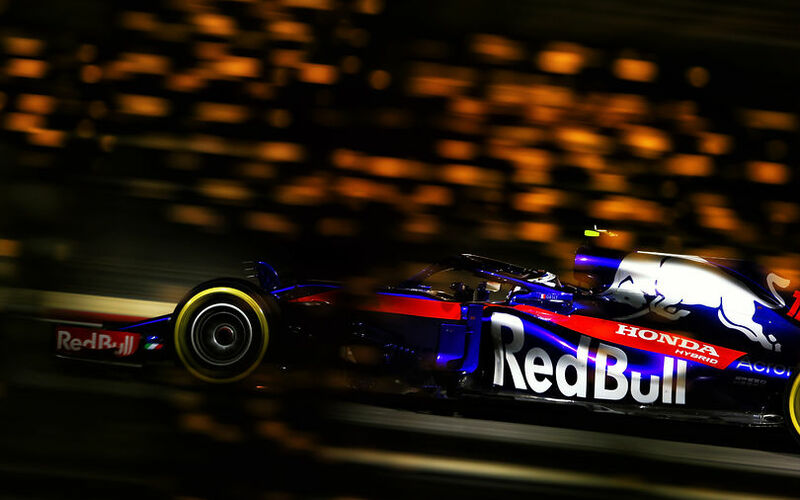 "We arrived in Bahrain with a new aero package and also Honda came with some modifications, and from the beginning onwards we saw that we improved the performance in comparison to Melbourne. On Friday we had both cars on different setups - Pierre was with the new specifications while Brendon was on the previous version - but after a few runs we realised the new upgrades worked as expected and as calculated from CFD and the wind tunnel. "On Saturday both cars were identical. Pierre had a very good qualifying by finishing sixth, which meant he could start from fifth position because Hamilton got a 5-place grid penalty after a gearbox change. Also Brendon showed good performance and finished in 11th place, just one-tenth of a second behind Q3. The start of the race from both drivers was quite good. Pierre defended his position and came back from the first lap in fourth, he then fought against Magnussen in a very good way and kept his position until the end of the race. I must say, that he controlled the speed by managing the tyres and the fuel in a very professional way. "Generally speaking, we are very happy with this result. To finish in fourth position in the second race of the year is really a very positive sign from Honda and from Red Bull Toro Rosso side. I’m quite confident that we have what we need to keep this level of performance – maybe not finishing fourth all the time because we mustn’t forget that Verstappen and Ricciardo didn’t finish the race – but nevertheless I’m convinced that points are possible in all of the races. "I want to thank the Research & Development department of Honda in Sakura, they did a fantastic job during the winter months significantly improving the performance, as well as the reliability, and the result is that we are now fighting for front positions. "Thank you also to the aero department in Bicester, they really did a good job because all of the upgrades worked as expected. Congratulations to Honda and the team for the great job." Honda on their behalf underlined the team had worked hard on the back of the difficulties experienced at the Australian Grand Prix.